Law firm websites have a great deal in common with news websites like NYTimes.com and Bloomberg.com. Both types of website are chock full of smart, insightful writing. And both types of websites are most effective when their visitors are highly engaged—consuming one page after another. There is, however, one big difference. 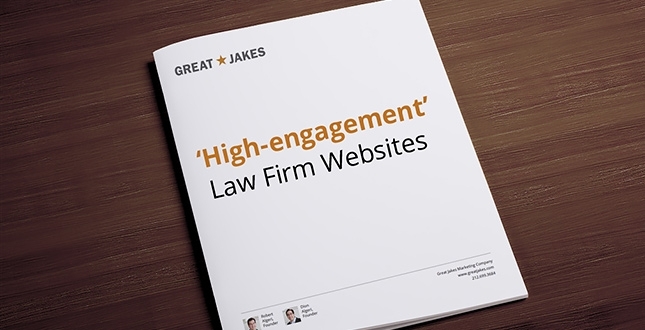 Most law firm websites are not built for engagement. At Great Jakes, we have studied how leading news and professional firm websites (like NYTimes.com and McKinsey.com) maximize their visitor engagement. Our research has led us to craft a whitepaper on how law firms can leverage similar techniques. (b) maximize the exposure and impact of that content. In short, as firms invest in developing more content, they are looking to maximize the return on that investment. So, it only makes sense that there is now increased interest in content-teasing tools that help to maximize the chance that visitors will read the firm’s best reputation-enhancing content. Please fill out the form below to download a copy now. Hi, guys! Wish you were here! ha. Happy Valentaine’s Day! This is really great content. Thanks for sharing! !